With literally dozens of new trading bots available online, one must make sure that they are in fact investing their money with a trustworthy trading platform. There are far too many fraudulent trading software programs out there, so it is wise to do your research before investing a huge amount of cash with one of these systems. Maximus Profits is one of these systems that claims traders can earn up to 6 figures a day using their automated trading program. Is this possible? Are they telling the truth or just trying to steal your savings? Read our Maximus Profits review for the inside scoop. George Maximus is the CEO and creator of Maximus Profits. He says that his years of experience trading binary options have provided him with the ability to create a trading system that is virtually unstoppable. He claims that he can turn average day traders into multi-millionaires in just a matter of months. Apparently, Maximus Profits has a huge success rate and rarely, if ever, loses a trade. Now we all know by now that this is completely impossible, not a single trading system in the market, even the best, can accurately predict every single trade. The market fluctuates daily and can be quite unpredictable. While there are systems that have a success rate as high as 87%, no system can boast of a 100% winning ratio. 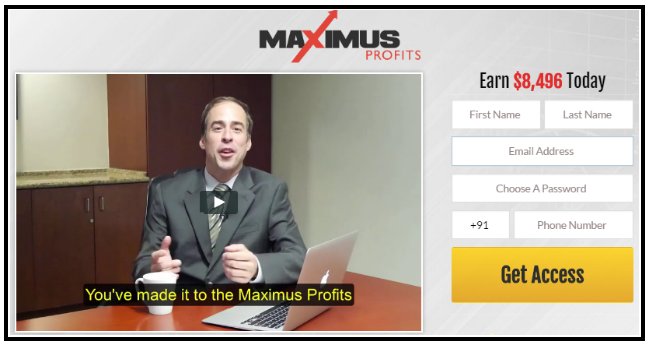 Upon our investigation, we discovered that Maximus Profits is not a reliable trading system. More traders have lost their money than have earned a profit. There have been dozens of negative reviews degrading the system so we do not feel it can be trusted as this time. If you wish to trade with Maximus Profits you must sign up with a broker that they provide as you do not have the opportunity to choose your own broker. Then you must despite at least $250 and then you can start trading with Maximus Profits trading software. If you see any profits, you can withdraw your money according to the terms and conditions established by your broker. However, we read a lot of reviews that complained that traders could not get hold of their funds. We do not feel this is a sign of a good trading system and their policies are a bit vague so we cannot in good faith recommend Maximus Profits as an honorable method of trading. Conclusion: Is Maximus Profits a Scam? We do not have definite proof at this time that Maximus Profits is a bogus trading system, but we do not advise investing your money with this system. We have seen way too many negative reviews regarding the legitimacy of this trading software. We believe you would profit better with a more trusted trading system at this time. 7 Binary Options review: Maximus Profits: 1 stars.